If memory serves me right, we were first given a glimpse of our adorable emotions during Big Hero 6 film previews, and I was instantly hooked. The premise was innovative and it left me wondering how Pixar was going to pull this one off. Disney Pixar’s Inside Out had already been released in the US earlier in June, and viewers were nothing short of amazed at the entire production–the animation, the storytelling, and the execution. 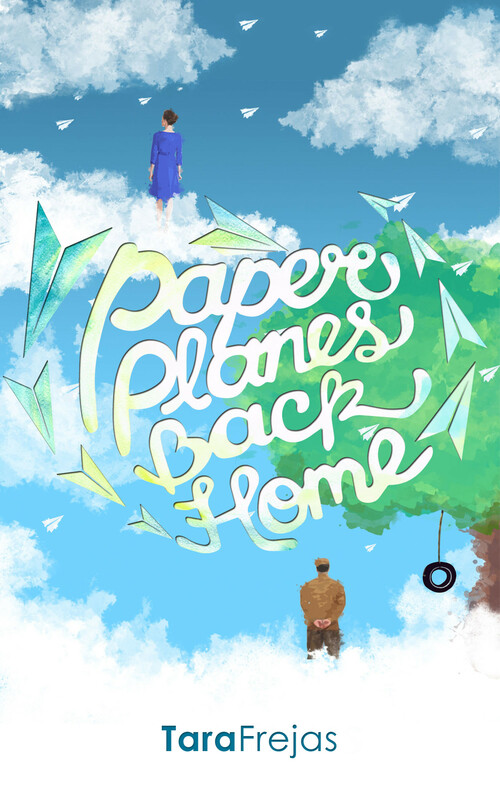 It has so far received a 98% rating on Rotten Tomatoes, and every day, more reviews about how Pixar has “done it again” surface on the internet. This is very, very exciting news, not only for me, because I have been excited about this film since I’ve seen the previews, but also for moviegoers who are looking for a fun movie to enjoy with their family, friends, or colleagues. 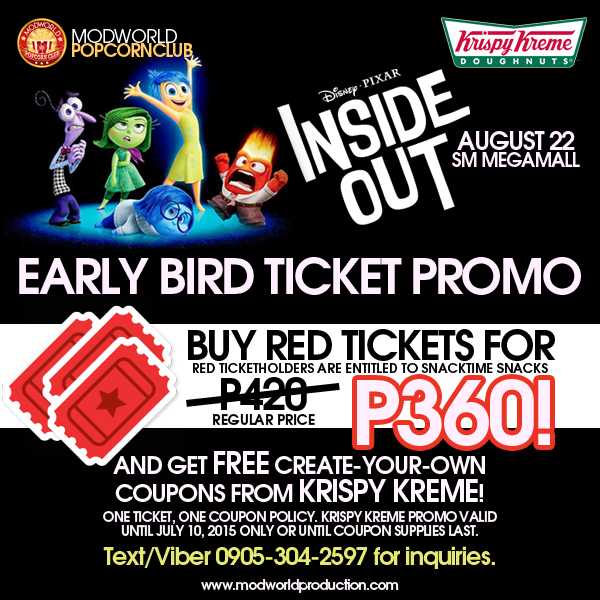 The Modworld Popcorn Club–an events entity of Modworld Production Management, Inc.–is holding a special block screening event featuring Inside Out on August 22, 2015, 8:00 PM, at the SM Megamall Cinema 6 and tickets are now available in discounted prices! 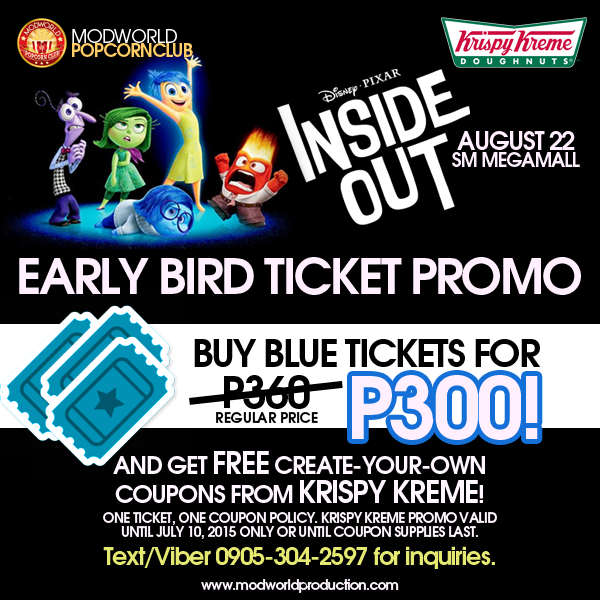 #MWPopcornClub offers a Movie Ticket + Krispy Kreme freebie combo from now until July 10 (or until coupon supplies last) for only P300 (BLUE tickets) and P360 (RED tickets: with snacks from SM SnackTime). Krispy Kreme Create-Your-Own coupons entitle you to a customized doughnut, a cup of their Signature Coffee, and an Original glazed doughnut, all for FREE! 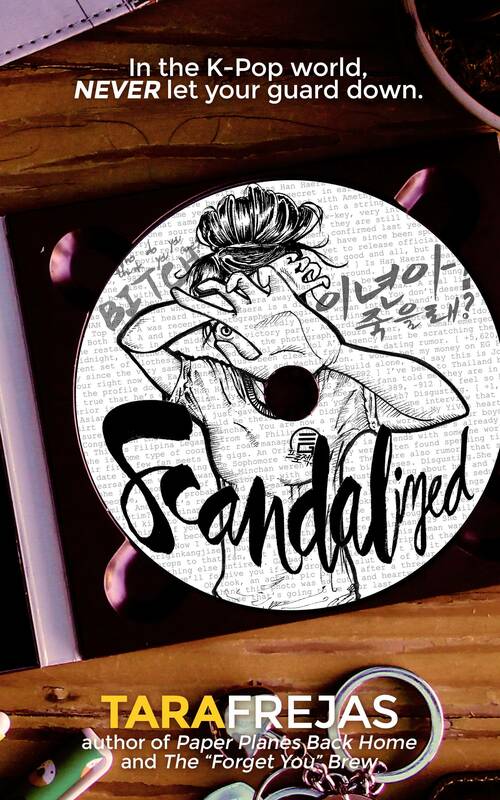 Additionally, there is also a Movie + Play combo which includes an Active Fun Unlimited Play voucher per ticket purchase. 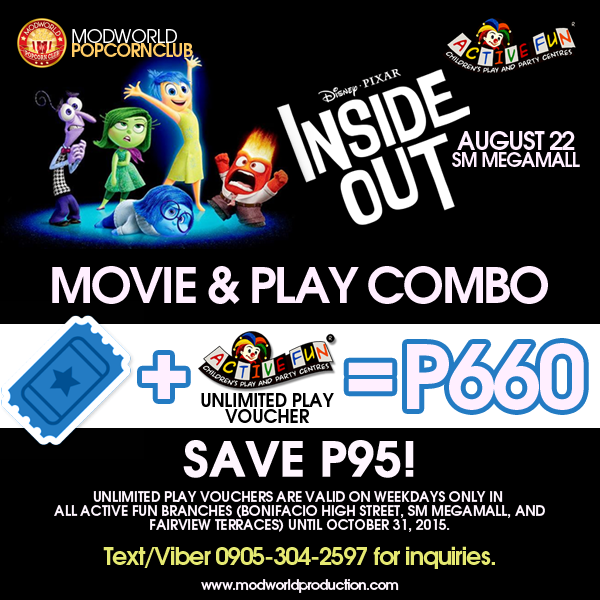 The Movie + Play combo is available for P660 (BLUE ticket + Play voucher) and P720 (RED ticket + Play voucher). You get to save P95 per purchase and ensure a child’s enjoyment inside and outside the cinema. All Active Fun Unlimited Play vouchers are valid on weekdays at any of the Active Fun branches (Bonifacio High Street, SM Megamall, and Fairview Terraces) until October 31, 2015. Wanna enjoy Inside Out with your family or barkada? Buy your tickets today and you may even get the chance to win special raffle prizes from our sponsors! Text or Viber 0905 304 2597, or visit http://www.modworldproduction.com to purchase your tickets online.